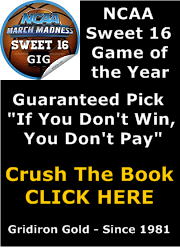 The sportsbooks advertised on www.yourbookiebeater.com are rated and monitored by www.sportsbookreview.com All are rated (A) or (A+) as of September 2018. If you want more information about these sportsbooks and many others, just go to www.sportsbookreview.com​. The Old Codger has used www.bovada.com for the past 15 years but I strongly suggest you make your own decision on where to do your online sports investing. look through the valuable information to make your own decision on where to do your online sports investing.